like defining attraction, it perhaps better than any other place defines the general purpose and value of our National Park System...a monument to the underlying forces of nature, not to the unusual features of it. 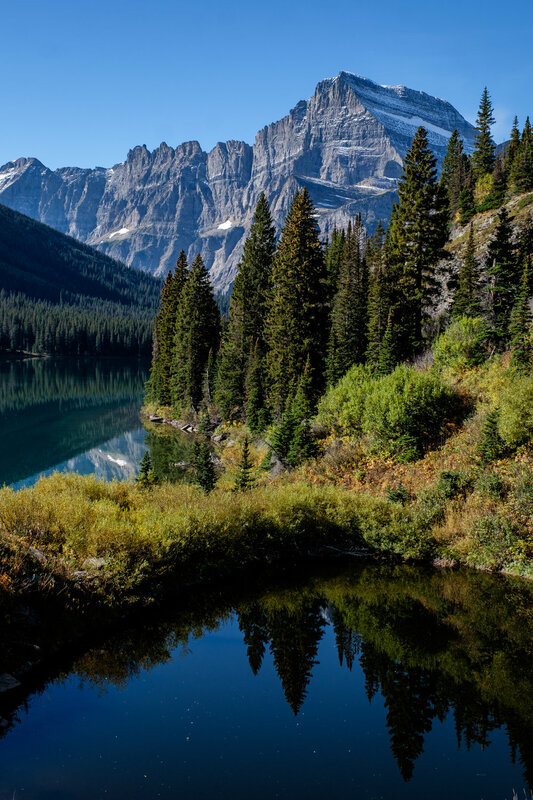 Glacier National Park in Montana is steadfastly considered to be one of the most beautiful places on Earth. John Muir once said that it holds "...the best care-killing scenery on the continent." The late Robin Williams called it God's backyard. 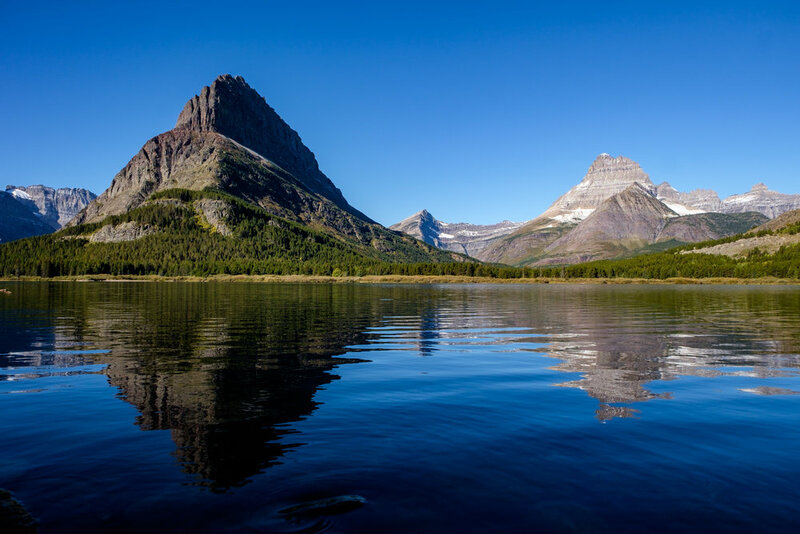 In 1890, naturalist and historian George Bird Grinnell described it as the “Crown of the Continent”—a two-tiered idea acknowledging the triple headwaters of the continent that flow out to three seas, and mountainous formations that decorate the rooftop of Big Sky Montana. Hiking into the sky at Grinnell Glacier. For millennia, the movement of glaciers in this area of the Rockies has carved out valleys and lakes while pushing peaks, cirques, ridges, and fins into the sky. Atop those peaks are snow and glaciers (which are sadly disappearing); and surrounding them are sub-alpine conifer forests and vast meadow slopes that create a wonderful home and habitat for wildlife. The grizzly bear—whose population of 300-strong beckons people from all over the world for a sighting—is the most recognizable species of them all. As you dig in, you will start to see creatures that are essential to the strength of the ecosystem including scores of birdlife, elk, moose, and mountain goat—the last of which has become a symbol for the park. From January to March, Glacier is a premier destination for cross-country skiing, snowshoeing, and for other winter sports. In the fall, autumn leaves burst with color complementing the epic mountain scenery. 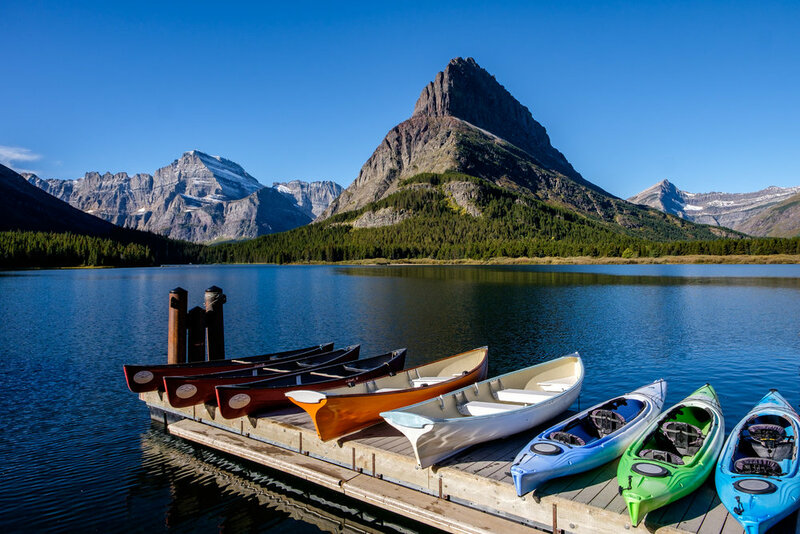 During summer, people come to see wildlife, go camping, fish and boat on perfect glacial lakes, and hit the ground to explore a trail network surpassing 700 that are consistently maintained. 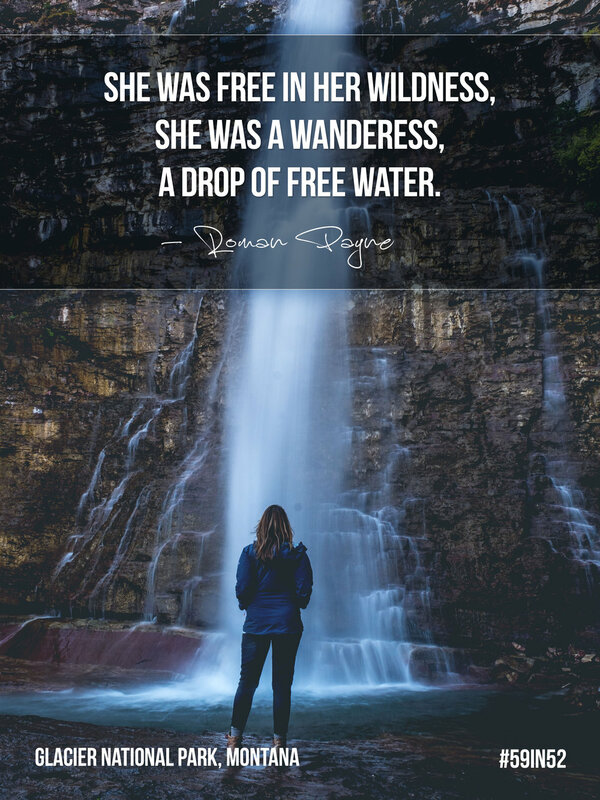 Long-distance treks, day hikes, wilderness walks, and backpacking adventures transcend visitors to that carefree state of being that Muir spoke of so long ago. Along these trails, visitors find out why Glacier is regarded to be among Earth's most lovely places with every sublime step. This environment is truly a wilderness hiker’s paradise. In that spirit, we are sharing 5 epic hikes in America’s 10th national park. The Avalanche Lake hike kicks off with an incredible stroll through the Trail of the Cedars. Beginning at the Trail of the Cedars off of Going-to-the-Sun Road is this awesome, 4.5 mile half-day hike that is totally unique in the park. The first section crosses an elevated boardwalk through ancient red cedar and western hemlock trees, and onward through dense vegetation of ferns and mosses. 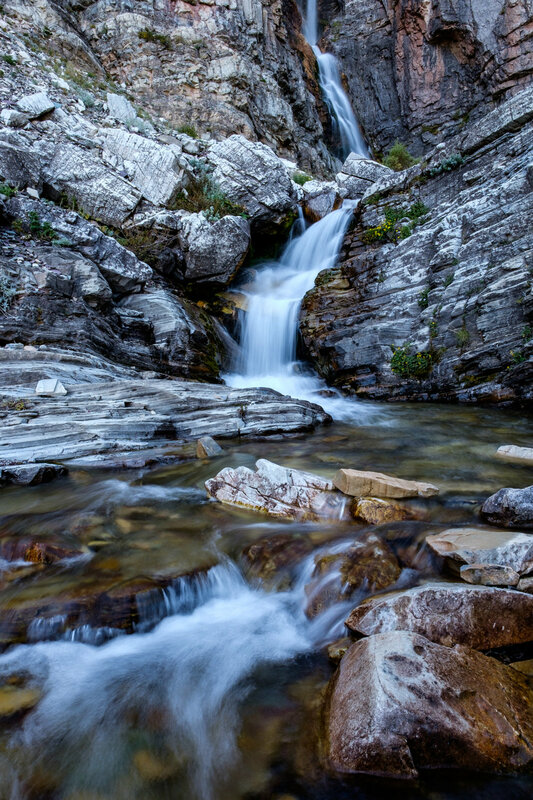 Where the forest-walk ends, the moderate hike begins as you ascend aside a roaring Avalanche Creek as it rushes downward through a narrow gorge. Its power is a result of glacier runoff cascading down from high mountain peaks that eventually give way to clear, blue, still reflective waters. On the shores of Avalanche Lake, the peaceful setting continues as it changes, with spectacular views of Bearhat Mountain prominently dominating the skyline above the lake. The Hidden Lake Trail is a foray across diverse terrain starting in a forested area at the Logan Pass Visitor Center before winding across alpine meadows that are home to many wildlife species including mountain goats, sheep, wolverine, and grizzly; during the spring and summer, this area is blanketed with colorful displays of wildflowers. You will take in your first glimpse of the twinkling alpine blue lake at the Hidden Lake Overlook, where the iconic Bearhat Mountain towers over the scene. The shores of the lake are located 1.5-miles down from the overlook across relatively easy terrain on a well marked trail. 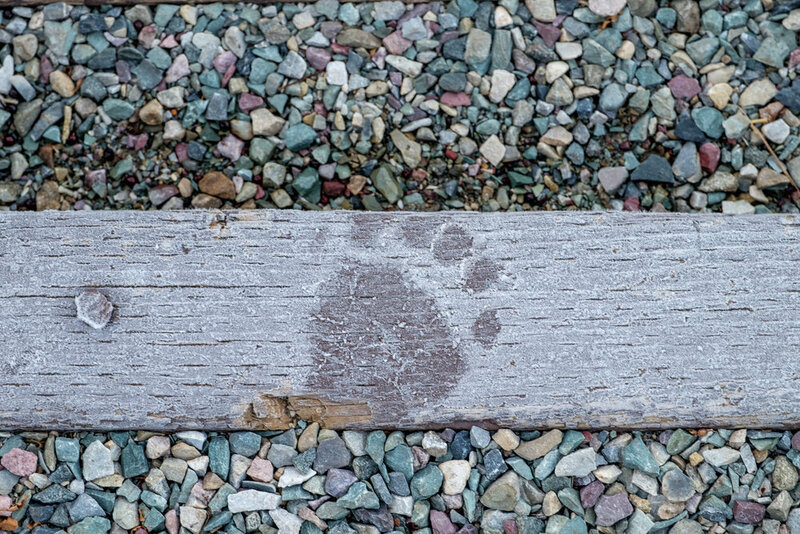 Because of its easy starting location at the visitor center, its relatively short distance (1.3-miles one way,) as well as the fact that much of the early part of the hike crosses a wooden boardwalk, this first section is a great easy adventure for large groups and families. 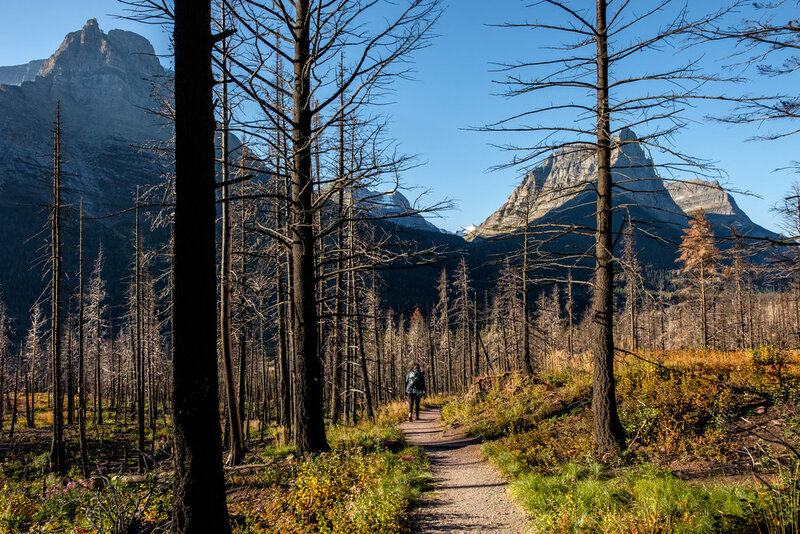 Starting at 6,375 feet, it is also a great acclimatization hike to prepare your body and breath for the thin-air environment before setting off on other hikes in the park that face an even higher elevation gain, which most big hikes in the park do. View from the Hidden Lake Overlook. Jonathan captures the sub-alpine wilderness and the snowy autumn landscape. 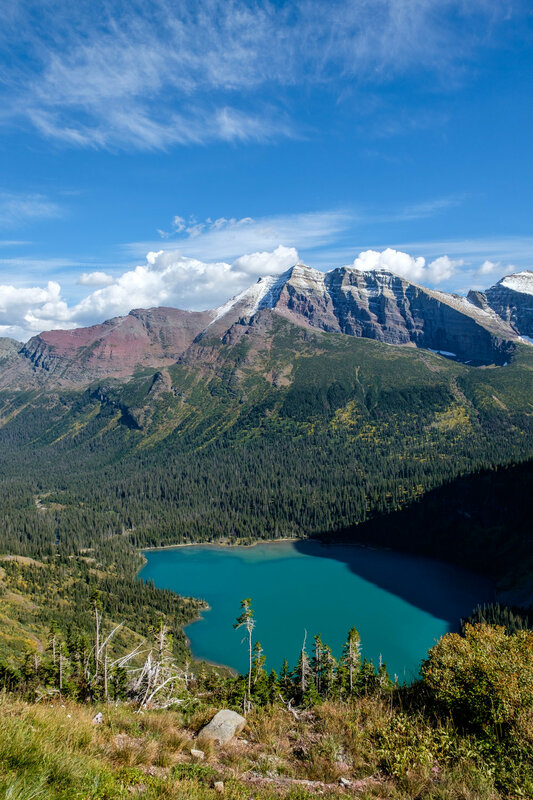 The Grinnell Glacier Trail starts at a gentle incline before ascending 1,600 feet across terrain that is a mixture of crystal lakes, glacier views, and gorgeous peaks accentuated by the drama of Mount Gould, standing at 9,554 feet. At the top of the hike is a small alpine pool where you can see icebergs—a rarity in the park and a great place to stop to refuel with some food before starting the equally intense descent down the range. 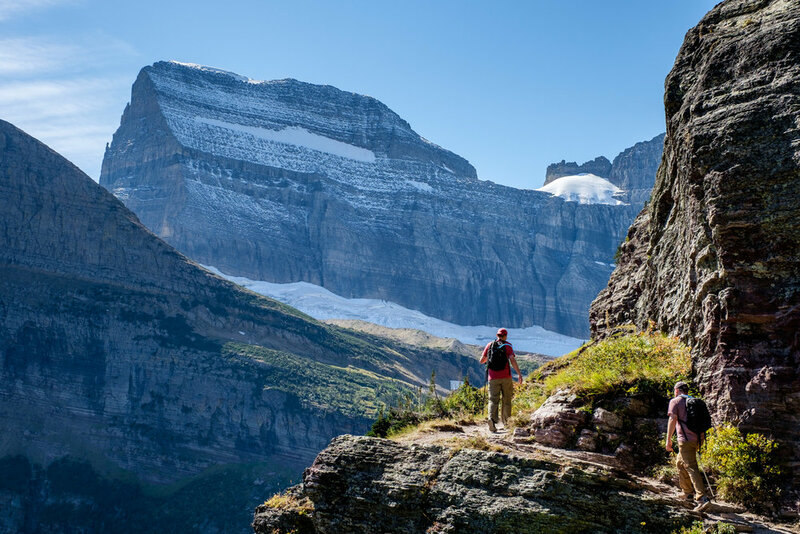 This 10.3-mile out-and-back trail is far and away one of the most popular hikes in the park because it showcases everything that makes Glacier so epic, all rolled into one full-day hike. 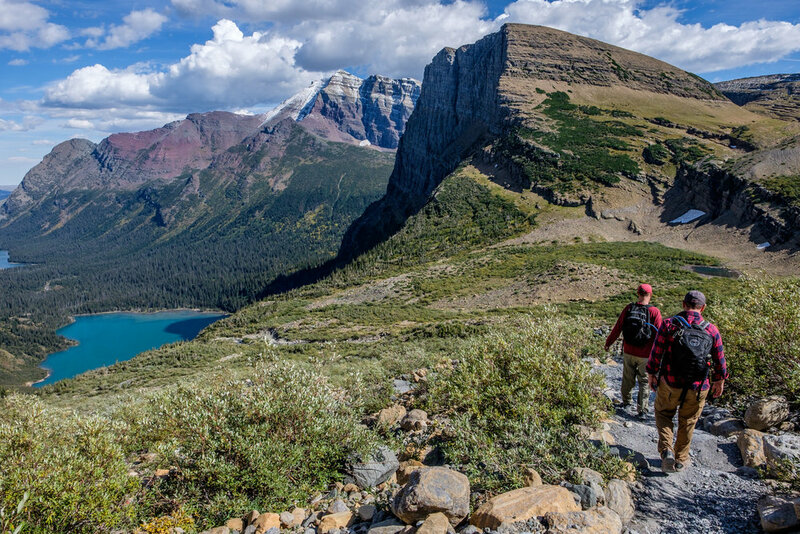 The Grinnell Glacier Trail is one of the most popular in the park. The views on the descent are just as jaw-dropping as they are on the way up! 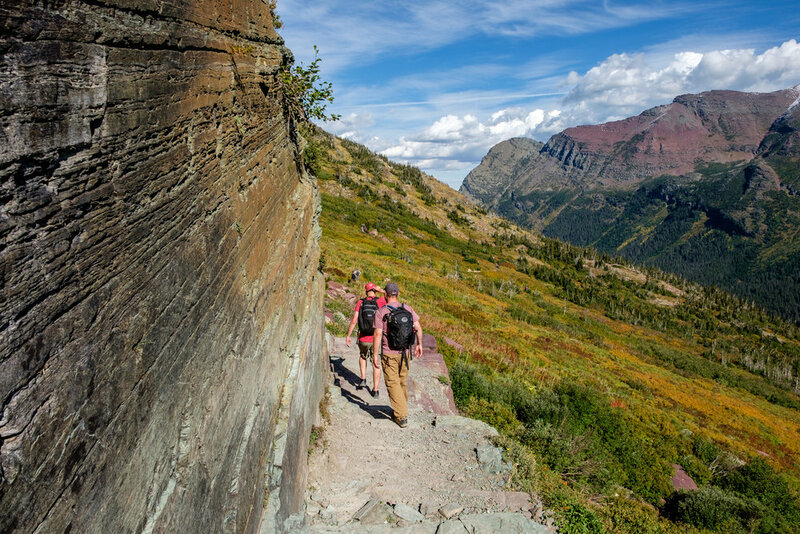 If there is one hike not to be missed in Glacier, it is the Highline Trail. 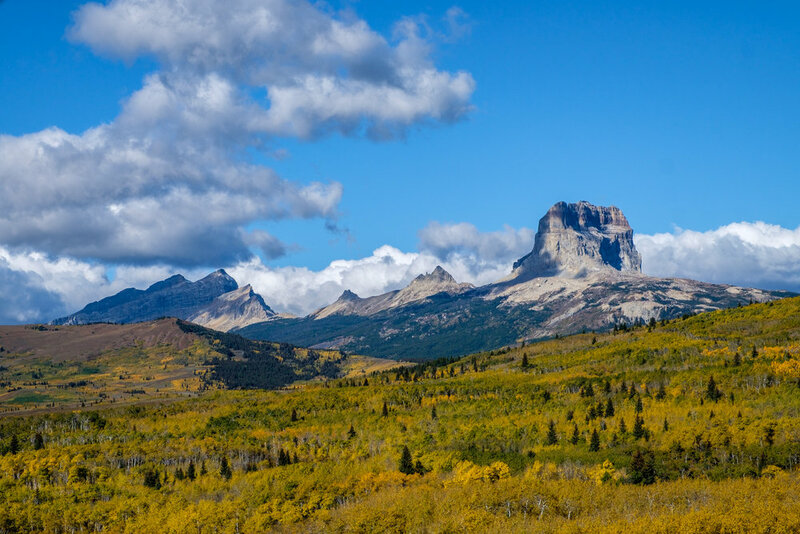 There are several ways to tackle it—our recommendation is to park your car at the Loop parking area then hop on the free park shuttle to the Visitor Center (VC) at Logan Pass and head out from there. With dramatic views that are revealed instantly as you walk onto the trail, the beginning of it is typically quite congested. However, after passing the first couple of miles, the crowds begin to dissipate and you will find yourself quickly immersed in a sea of vast wilderness. At the Granite Park Chalet you will connect to the Loop Trail to begin your descent of 2,200-feet across four miles which eventually brings you back to your car in the parking lot. Note that this 11.8 mile beast is not a "loop” trail, that name was designated as a reference to a bend in the trail. 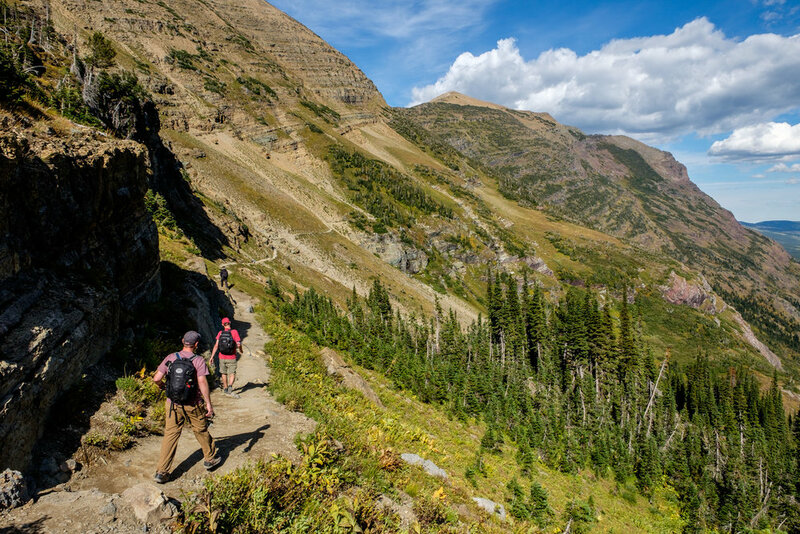 One of the very cool things about this trail is the birdseye view of Going-to-the-Sun Road. A classic view from the Highline Trail. 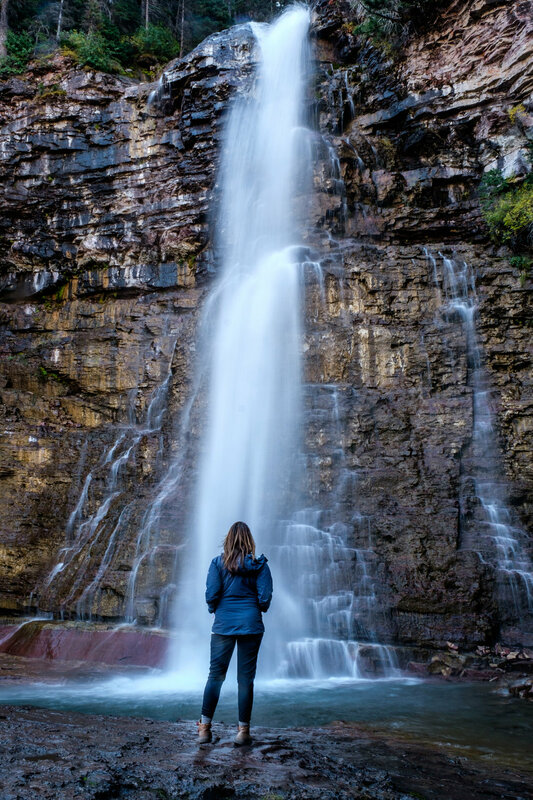 If you are looking for a hike with abundant waterfalls within a lovely protected forest, this network of trails is your jam. From the St. Mary Trailhead, the hike meanders a series of foot bridges across St. Mary River before climbing up to two-tiered Virginia Falls. As you continue to make way through the conifer forest, you will find that this trails is not one to just two falls, but a waterfall spectacular. 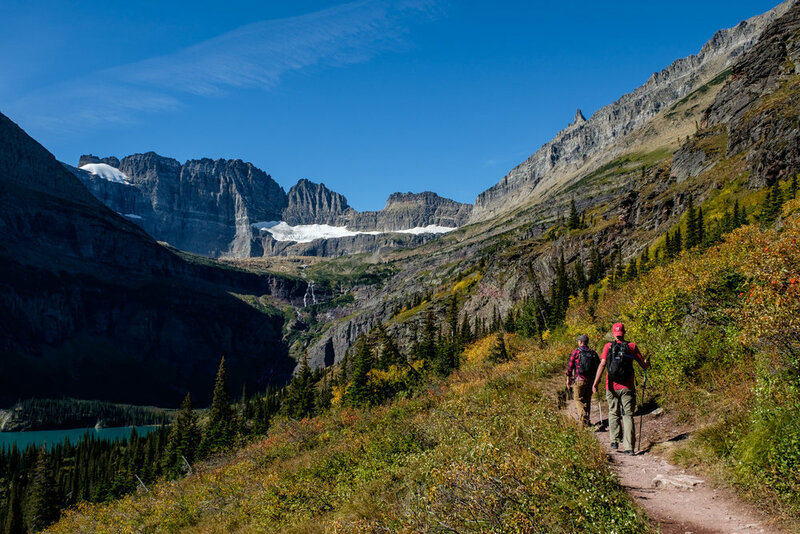 Easy access from Going-to-the-Sun Road and makes this hike a an all-time-favorite in the park for visitors of all ages. Vegetation and river stone make for nice structure to capture in photographs. Our good pals Keith and Danny take in the skyward view at Virginia Falls. Waterfalls are seemingly endless along this popular trail. 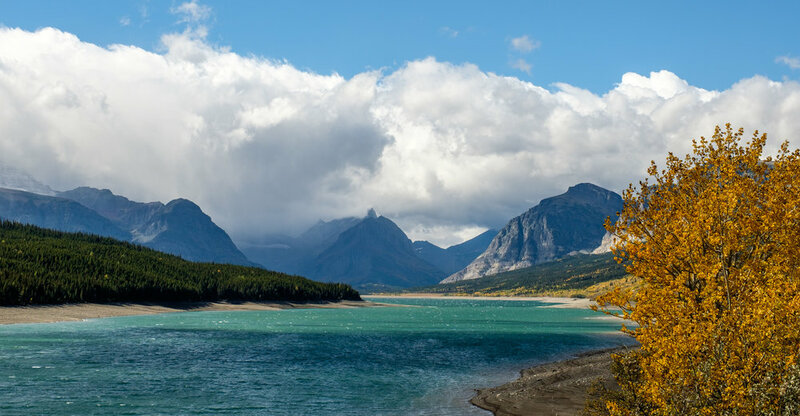 How the park got its name: Glacier National Park was named for prehistoric glacier activity that carved the landscape during the last Ice Age. Wild Goose Island sprouts up from the center of the very reflective St. Mary Lake. This viewpoint can be accessed from Going-to-the-Sun Road. Accessible adventure: When Governor Frank H. Cooney dedicated Glacier’s Going-to-the-Sun Road in 1933, he offered this sentiment: “There is no highway which will give the seer, the lover of grandeur of the Creator’s handiwork, more thrills, more genuine satisfaction deep in his being, than will a trip over this road.” Some form of this sentiment must be true as this thoroughfare has become the park’s main attraction and is known as one of America’s most iconic scenic driving roads. 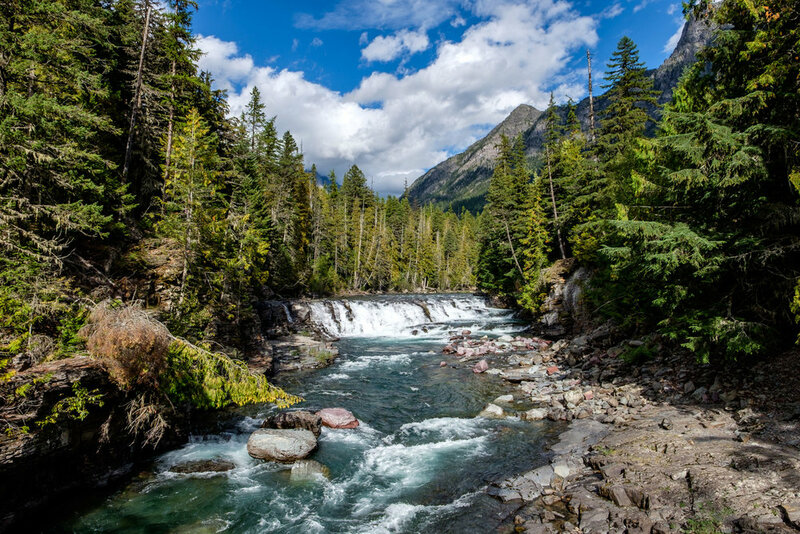 Bisecting the 1-million-acre wilderness, the 50-mile drive starts at the west entrance and winds into the national parkland passing evergreen forests, glacier lakes, and endlessly stunning snowcapped peaks rising into the skies. Panoramic views don’t get any better than they do when you are standing at Logan Pass, where you will find yourself surrounded by breathtaking scenery amid what is called “the backbone of America,” or, the Continental Divide, which separates the watersheds that feed into the Pacific and Atlantic oceans. You can complete the drive on this well-paved road in just two hours, but you can pretty much be guaranteed that with so much beauty to behold and with chance wildlife sightings, it will take much, much longer. There is no gas available on the road and there are vehicle size restrictions so plan ahead by checking out the dedicated page on the park website in advance of your visit. Big adventure: It isn’t often that our pick for Big Adventure is also among the most popular activities in the park, but that isn’t a huge surprise for such an exceptional trail located in a park that is beloved by wilderness hikers. 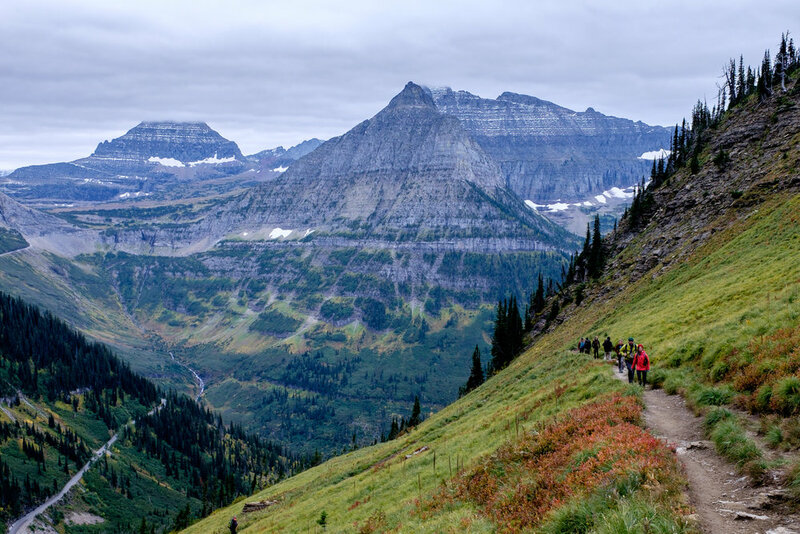 Where Going-to-the-Sun Road meets Logan Pass, just outside of the visitor center, the 11.8-mile Highline Trail to the Loop Trail starts its long traverse across the rugged terrain of the Continental Divide. This hike is long and challenging, descending 3,572-feet from an elevation of 7,275-feet. Between the sheer exposure, drastic elevation changes, and its location in the heart of grizzly country, this hike is beyond the comfort zone of many… and for those who like that more challenging environment, the hike is just beyond. As you start to make your way farther down the trail, you find yourself in a vast wilderness of solitude. A most classic view of the Highline Trail as it starts out from the trailhead at Logan Pass. 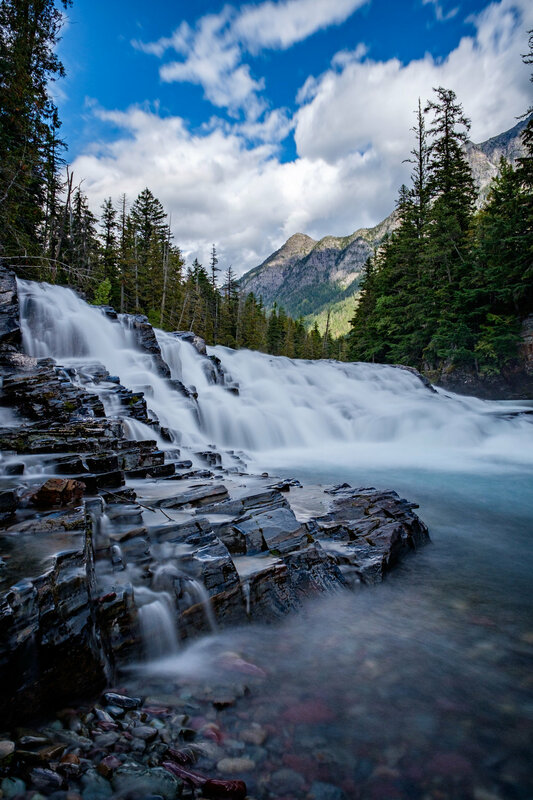 Located just across the U.S./Canadian border from Glacier National Park is Waterton Lakes National Park, which shares a wilderness that knows no boundaries. It is the world’s first “International Peace Park,” established in 1932, a joint effort in the preservation of a shared wild ecosystem. Each year since, a symbolic ritual has been upheld by Rotarians, when they shake hands across the border in a pledge of goodwill. Glacier National Park in Montana and neighboring Waterton Lakes Park in Canada are in the running together to become the first multi-national dark sky preserve. Fingers crossed! Glacier and Waterton Lakes recently applied for IDA (International Dark Sky) accreditation. Says the Park Service: If successful, this designation will be the first multi-national dark sky preserve and will be given in conjunction and with the approval of two organizations: the International Dark Sky Association and the Royal Astronomical Society of Canada. Fingers crossed and good luck! Going-to-the-Sun Road is registered as a National Historic Place, a National Historic Landmark, and a Historic Civil Engineering Landmark. That’s a lot of well-deserved decoration, it truly is one of the great driving roads we've seen this year! As an aside, it is also a world-class road biking destination. Glacier has been a location used in many popular films. Forrest Gump ran there when he “just started running;” Meryl Streep and Kevin Bacon did many of their own stunts as they navigated whitewater on a family vacation in the 1994 movie A River Wild; and opening scenes from the film The Shining starring Jack Nicolson were filmed on Going-to-the-Sun Road. Glacier National Park has the largest population of grizzly bears in the contiguous U.S. with approximately 300 roaming the landscape. Staying safe in American bear country is an important concern for all entering parks with bear populations. 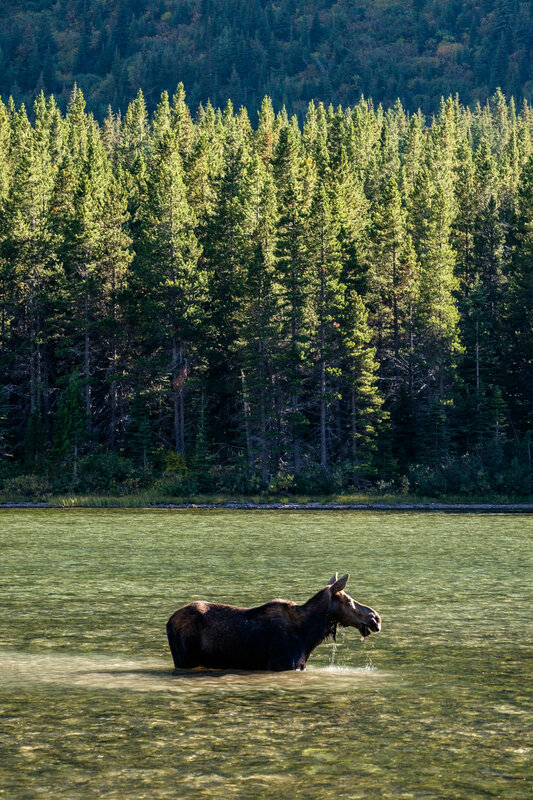 Just a short and easy hike on the Swiftcurrent Nature Trail from the very popular Many Glacier Campground will bring you to Fishercap Lake, one of the best places in the national park to watch moose feeding in their natural habitat. 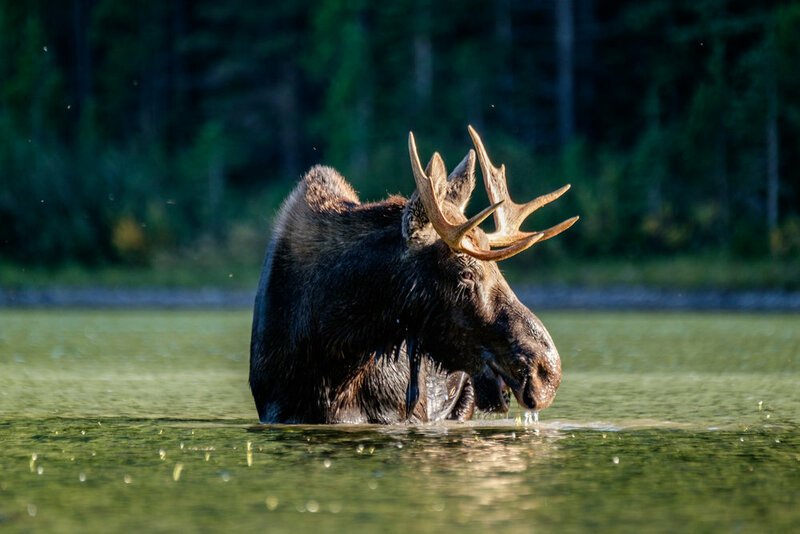 Pictured here is a young bull moose, eating aquatic grasses in the center of the lake. While grizzly bears are perhaps the biggest draw to the area in terms of seeking wildlife, there are other big game sightings to be had as well. Such creatures regularly seen include moose, mountain goat, big horn sheep, elk, black bear; lynx, mountain lions, and elusive wolverine are more elusive. The official wildlife symbol in Glacier National Park is the mountain goat. 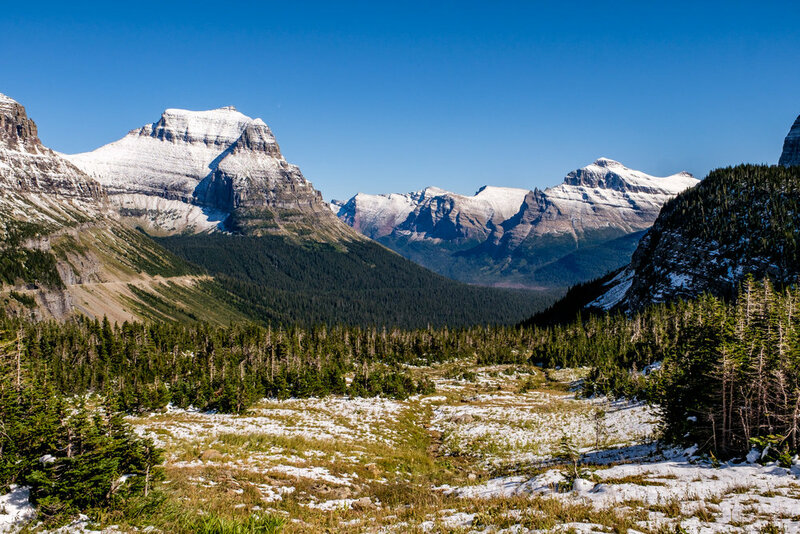 You can see them in the southern part of the park at the Goat Lick Overlook and at Logan Pass in Many Glacier. Only two animal species that roamed the parkland when it was established more than 100 years ago have been driven elsewhere, the American bison and the woodland caribou. 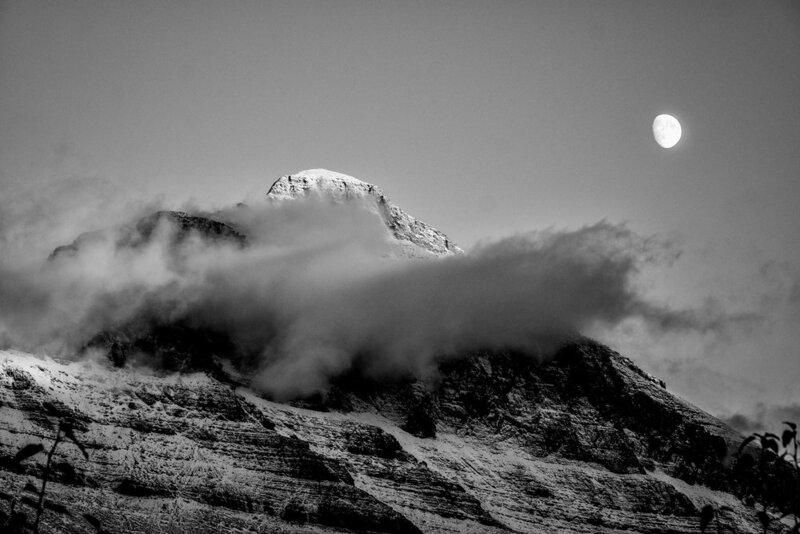 While the name suggests a snowy landscape, glaciers are steadily on the decline in Glacier. When President William Howard Taft established Glacier as a national park in 1910, there were approximately 150 glaciers within the protected boundary. Today, there are only 25. Scientists have projected that there will no longer be glaciers in Glacier National Park by as soon as 2020. The Glacier Research Monitoring Program ran by the U.S. Geological Survey is studying the activity and retreat of the icy monoliths. 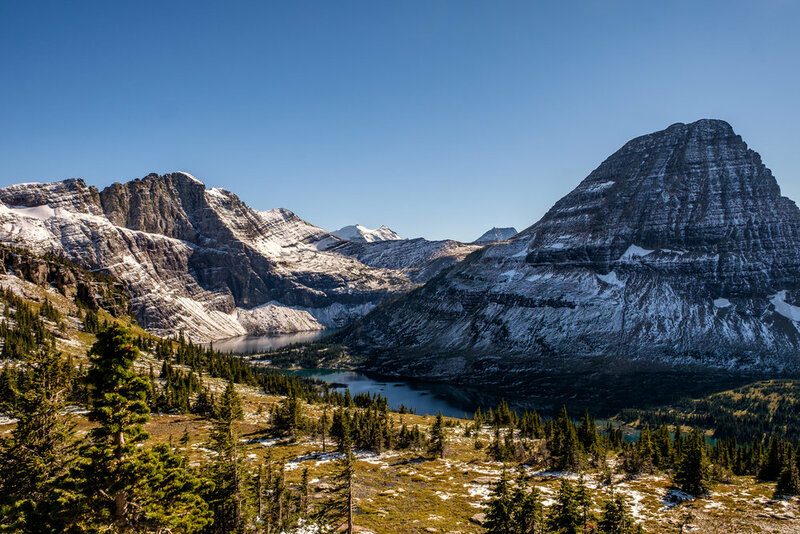 Scientists say that the area that now makes up Glacier National Park is a result of the last Ice Age. The mountains and lakes were once glaciers, which moved, morphed and matured over millennia to reveal what we see now. Due to extreme weather conditions, many of the accessible areas in the park as well as services are closed, including Going-to-the-Sun Road which is open only from June through October. There are at least 6 lodging destinations inside the park boundaries—all are open only during late spring through September. 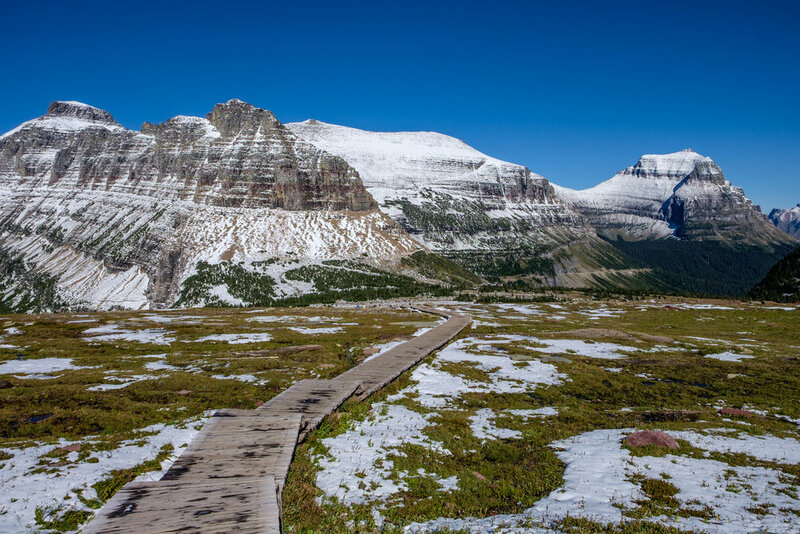 A section of the famed Continental Divide Trail crosses through Glacier National Park in Montana. Friends gather to take in the views on a dock at McDonald Lake, the largest lake in the park. 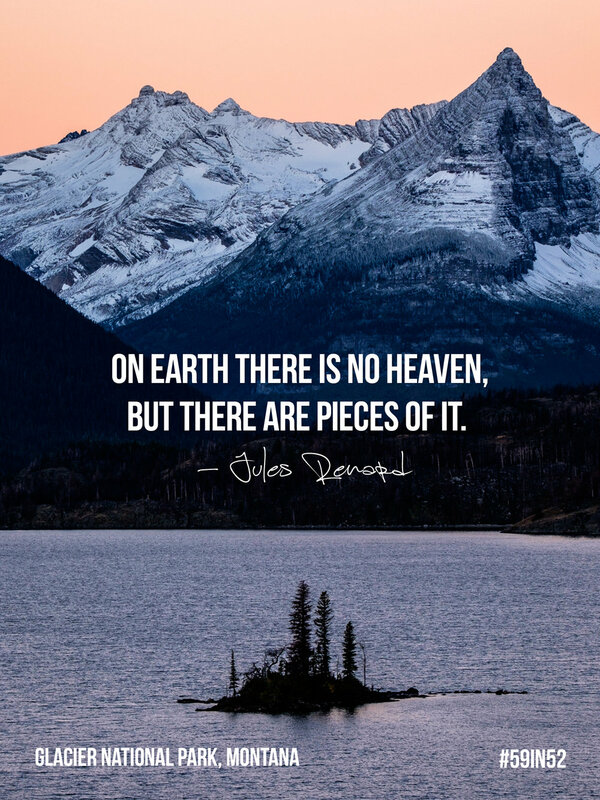 The largest lake in the park is Lake McDonald—it is 9.4 miles long; 1.5 miles wide; and 464 feet deep. 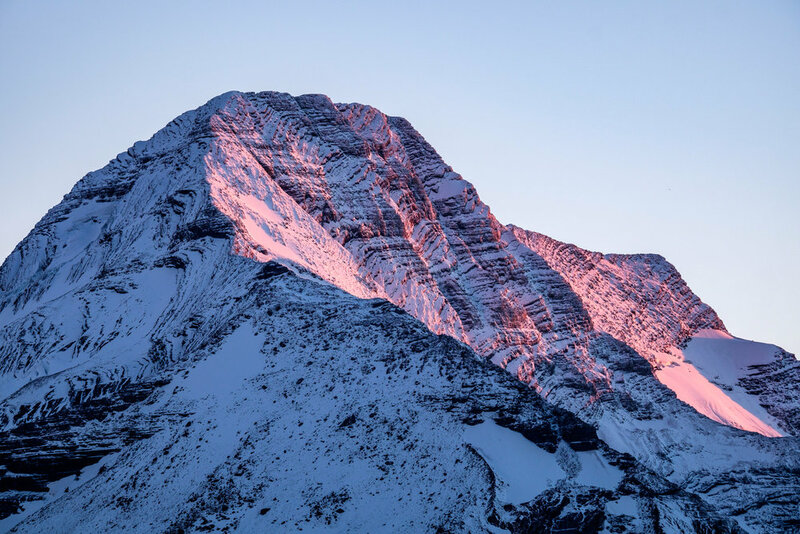 Triple Divide Peak located within Glacier National Park is the source for headwaters flowing to the Pacific Ocean, the Gulf of Mexico, and Hudson Bay. Evidence of human presence in the area goes as far back as 10,000 years. When European explorers first came to the area, Blackfeet, Salish and Kootenai Indians lived there. 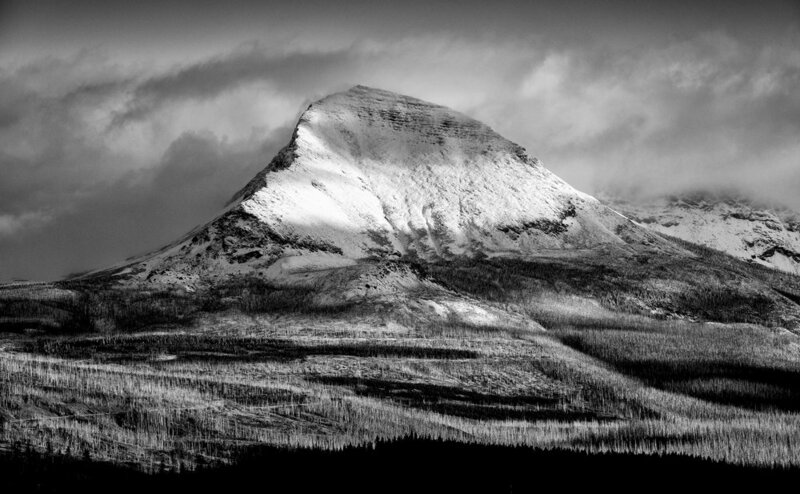 Chief Mountain, considered to be the most sacred on Earth to local Native American tribes. 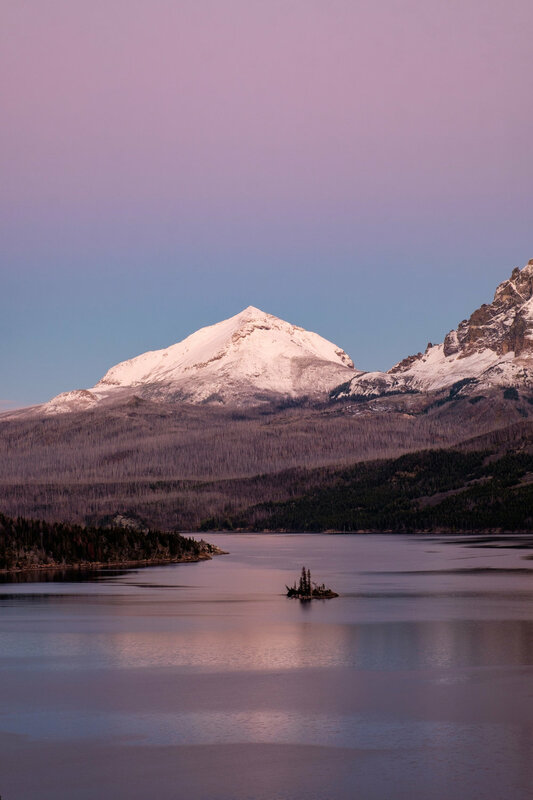 Chief Mountain, standing at 9,080 feet and straddling Glacier National Park and the Blackfeet Indian Reservation, is considered to be the most sacred mountain on Earth to the Blackfeet, Salish, Kootenai tribes. 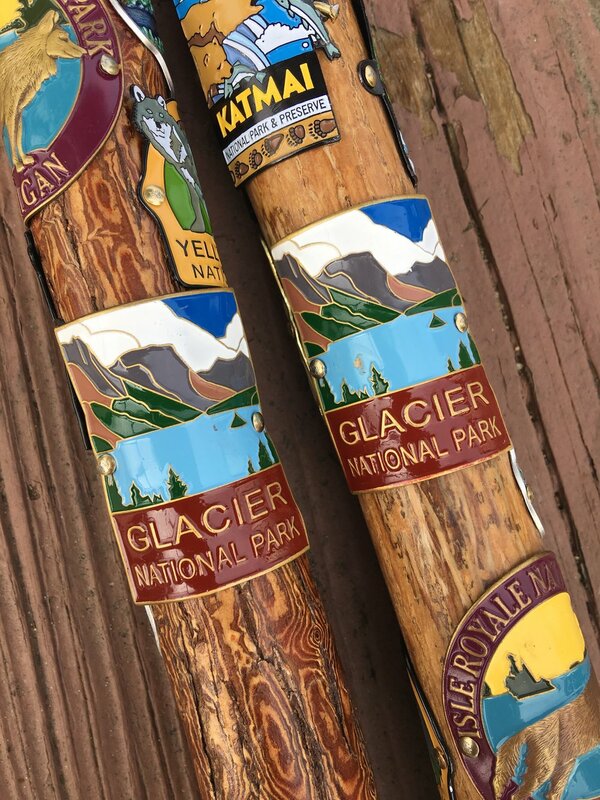 Similar to Voyageurs National Park in Minnesota, Europeans came to northern Montana in search of beaver pelts in the late 1800s, a highly fashionable commodity at the time. A classic wooden boat used for guests tours, the "Morning Eagle," enjoys a moment of rest on the perfectly clear Josephine Lake. Look at the color of those rocks! Glacier National Park has preserved historic tours within the park. The infamous concessioner-operated "Red Bus Tours" have been operating since the 1930s; and since the 1920s, historic wooden boats have taken to the still and reflective lakes to glide guests across the glacial waters. While the location of this park is quite remote, visitation has increased every year since it was established in 1910. One of the entrances to Glacier National Park. 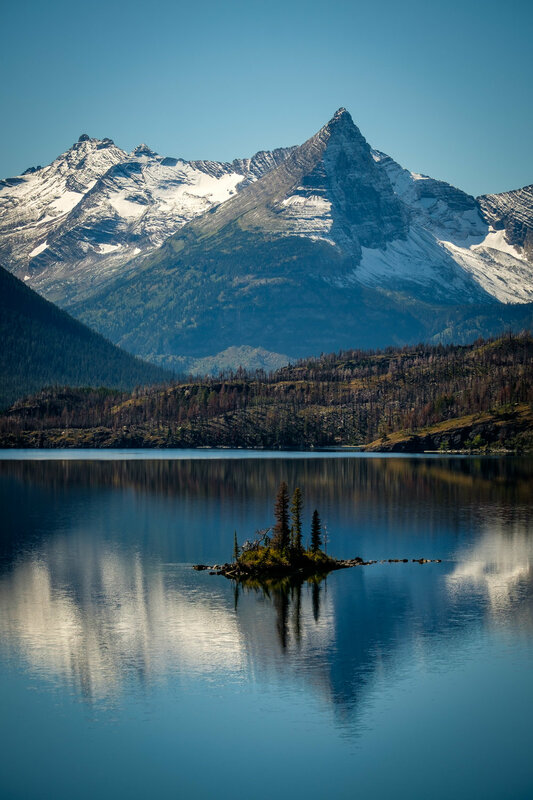 Montana is called the Treasure State, and Glacier, America's 10th national park, is a fine example of that! It is a UNESCO World Heritage Site, an International Biosphere Reserve, and home to the world’s first International Peace Park. There are free shuttle busses in the park there to drop visitors off at various trailheads and points of interest, reducing congestion that overwhelms the park during busy summer months. The effort to operate free shuttle systems in the busiest parks (they are in place at Zion, Grand Canyon, Rocky Mountain, and others) reduces pollution and pedestrian/traffic accidents at busy trailheads. Use the shuttle busses! Parking is a nightmare during peak season and we all have an opportunity to help that improve. 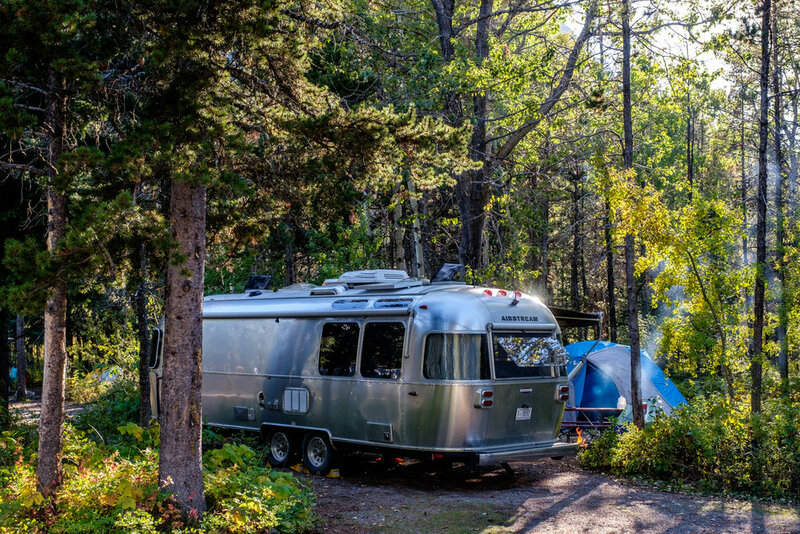 Wally the Airstream looks sharp during fall foliage in Glacier National Park in Montana! 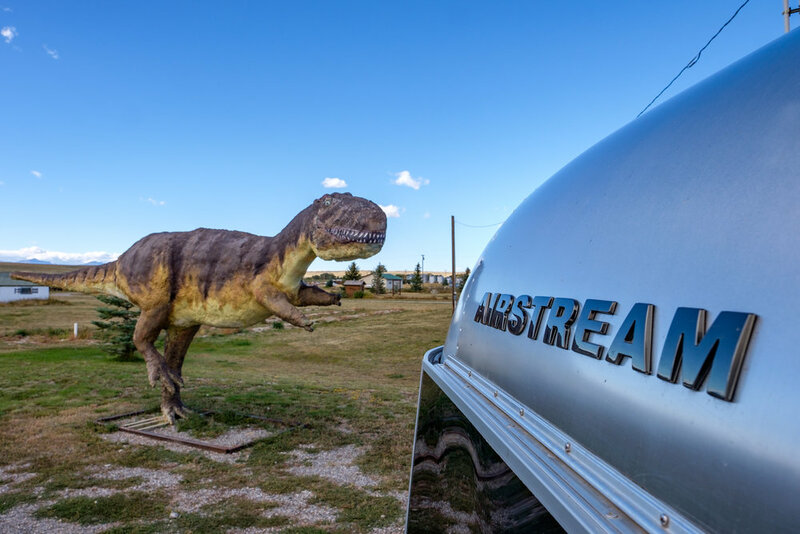 A special thanks to National Geographic, Fujifilm, Airstream, and Visit Montana for making this project possible.